It never fails. Life is plugging along swimmingly and then one morning can set you back three months. The first part of 2014 has been great so far. My novel is almost finished. Relationships with friends and family are going great. Matt and I are doing well, in spite of the constant marriage talk from the above mentioned family and friends (seriously, just stop it already). My goal this year was to stop sweating the small stuff and I think it’s gone well so far. Technically, it started a few days ago. I woke up with stabbing pains in my stomach that didn’t arise out of the usual suspects of maladies. What would usually end after a few Aleve and a workout have continued nonstop to the present moment. This morning, I awoke around 4am and thought that razor blades were coursing through my intestines. In my head, I know this isn’t good and I should probably check myself out but who has time for that, right? Between the stabby stomach, a snoring dog, and a snoring boyfriend beside me, I got approximately negative three hours of sleep last night. When my alarm first went off, I hit snooze until I suddenly realized that snoozing was no longer an option and I was going to be late for work. I skipped my shower (gross), threw my hair up in a bun, and pulled the first outfit I saw out of my closet. After feeding the dogs, I let them out my front door to do their business so I could get on the road. They are usually quick about it. Today though, I should have known better. I watched as they sniffed every nook and cranny of the bushes. They snubbed my calls to them and laughed in my face as they pranced around the yard, searching for ducks to chase. As I cursed their tiny souls and ran after them, I heard tweets coming from the ground. When I found the source, I saw two baby ducks waddling around the yard that my pups had somehow managed to miss. I grabbed the dogs and ran back inside for my phone. Despite the stomach pains, I rushed back to the scene of the baby ducks and snapped a few pictures for my 100 Days of Happy challenge. I took a moment to forget the fact that my day was royally sucky up until that moment. I forgot the fact that I was probably going to have to cancel my date night with Matt in order to curl up in bed or maybe even go see a doctor (not likely). It was just one morning and perhaps these so-cute-I-could-vomit baby ducks could maybe turn my day around. I walked back inside slightly happier. I gave one last goodbye to the pups, grabbed my purse, and headed out to face my crappy day. I knew it could get better. I promised myself it could get better. As I pulled out of my parking lot, I knew that life was going well and one morning couldn’t set back everything. At that moment, I slammed on my brakes to avoid rear-ending the car in front of me… and spilled my tea all over my clothes. 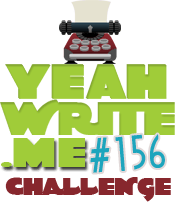 It’s Yeah Write’s 3rd Birthday! Come Celebrate! Just doesn’t seem right to “like” this post. I hope you feel better soon. Haha – It’s okay 🙂 I’m trying to stay positive. This damn day is just not making it easy! My dog always decides to take forever to do her business on days I’m running late. On Saturdays, when it doesn’t matter, she’s lickety-split. Feel better, dear. Mine too! Glad to know my pups aren’t the only assholes 🙂 Thanks! It almost seems intentional, like some sort of canine diabolical plot for the advancement of human lateness. Okay, so go into this knowing that I don’t go to the doctor’s either. I go once a year now because I get a discount on my insurance premiums if I do, but if that wasn’t the case I wouldn’t ever go, and before that little tidbit of insurance joy kicked in, I hadn’t been in probably 10 years. But… recurring stomach pain… might want to get that checked out. But, I just had a stomach bug a few weeks ago, that lasted for a little over a week… so, it could just be that. Meh. Ignore me. I’m just rambling. Hah. Well, yeah, nice to have a doc in the family! I just ignore aches and pains until they go away. Oh yes – I do the same 🙂 That’s why I still have a sprained thumb from January and a messed up rotator cuff from two years ago. Whoops! I told him I already play volleyball for four hours each week. I like how Fate hears you say “It’s going to be alright,” and then takes it up a notch. Hope you’re feeling better! You persevered! However, the stomach thing might be a stress ulcer or from too much caffeine. Or not. I was wondering ulcer for a bit. I should probably go to the doctor 🙂 Thanks! And despite all that you wrote an entertaining (although semi-heart wrenching) post. Get it girl. Days like this just totally drain you. I hope you’re enjoying some fine wine right now. Responsibly, of course. And by responsibly I mean DON’T SPILL ANY! 😉 Seriously, it’s a sad state of affairs when I’m the responsible drunk. Okay. Get some rest tonight and then drink (responsibly) tomorrow!! Um…see a damn doctor! I really don’t want to have to update the Blogging Alliance of the Damned roster again. I’m actually feeling MUCH better today. I think going to bed at 5:30 last night helped! Good times, sounds like an average day to me. Minus the ducks I guess. I hope your stomach pains turn out to be nothing! You reminded me of all the times I’ve spilled my beloved coffee on myself just as I’m almost out the door (or, worse, already on the road). Take care and here’s to a new day! I hope you have a better day today. I envy your ability to turn a bad day into humor, I turn into a dour, whiny brat! Don’t you love those days when the only thought that keeps you moderately sane is that ‘it can only go uphill from here?’ Ah well, looks like you can at least find the humor in it now. One of those days, huh? I read the comments and am glad you’re feeling better. Maybe the tummy thing is just stress? That’s what I was thinking! Who knows?! Your dogs sounds like my kids 🙂 P.S. Hope you get to feeling better soon. It’s so evil that your friends and family are pressuring you about marriage. Who does that? I love that you are always striving. Go you! I know!! We’ve been dating almost 7 years so I get it but I’m only 28! Why the rush?! Ugh – Thanks!! Chuckles over the dogs, yes I have encountered the pokieness on ‘those’ days.